Digging/Pickaxe:This is by far the Crovel’s strong suit. Due to it’s sturdiness, weight and heavy duty locking nut, the Crovel beats the other 2 hands down. The crowbar/hammer handle end allowed for extra grip and leverage. The only design change here would be a more pointed shovel head…crucial for getting through the tough shallow root system that exists in the swamp. One drawback was sometime the crowbar head would bite into my forearm if I was gripping the handle instead of the crowbar end while in pickaxe mode. Crowbar/hammer:Though a neat idea this part gave me problems. 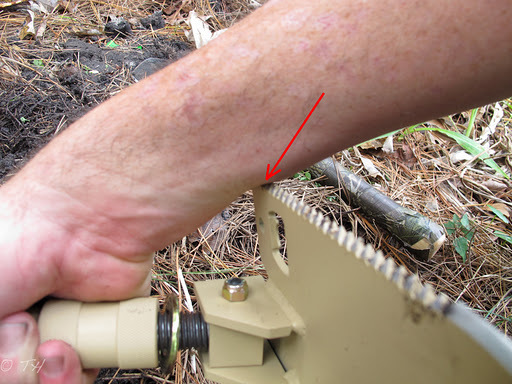 Due to the position of the crowbar/hammer, I was very limited on the amount of swing I could use due to the shovel head either getting in the way or biting my forearm (see pics). 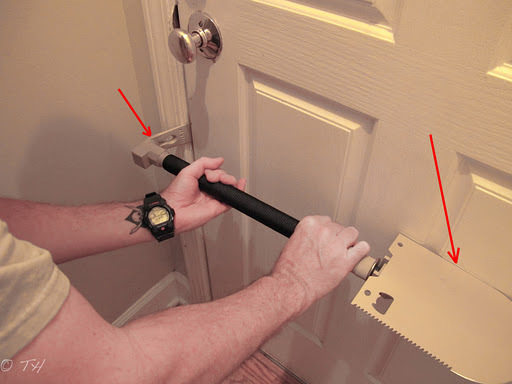 Also due to the angle of the crowbar head, insertion between a door and door jam was very limited. Zero angle would help somewhat, though the shovel head might get in the way regardless. Saw/chopping: The saw blade side of the shovel head is rather inefficient since the teeth are triangular and not off set. A substantial amount of effort was required. As to being used as a weapon…this would be the side to apply….due to the weight of the tool..probably the most deadly of the 3. The Crovel plain side is beveled, but not enough for chopping. 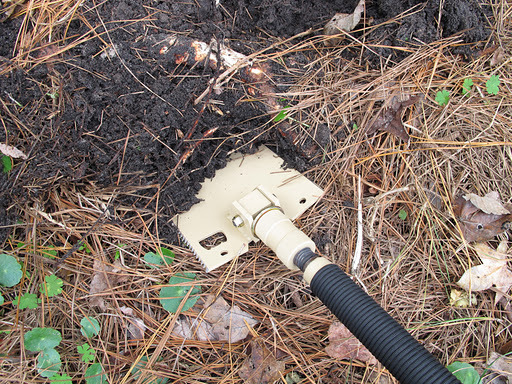 It can be used for splitting seasoned wood…it’s heavy weight allows it to be top in this aspect. At over 5.5 pounds, it simply is too heavy to add to a GHB. BOB…perhaps if one excludes other tools, but that weight coupled with full weapon/ammo compliment is too much extra. The challenge would be it would need to be attached near the torso since heavy weights should be mid/center and as close to body as possible when packing. Problems with the crowbar/hammer head utilization, make this aspect of the tool rather limited. The threaded shaft area the locking lug rides on quickly began to rust and will require a thin coat of grease to prevent future problems (minor issue). Though I like the concept of the Crovel it’s use beyond a shovel (or last ditch weapon) is limited in my mind. Tool in it’s most compact form. Adjacent pic shows the saw. 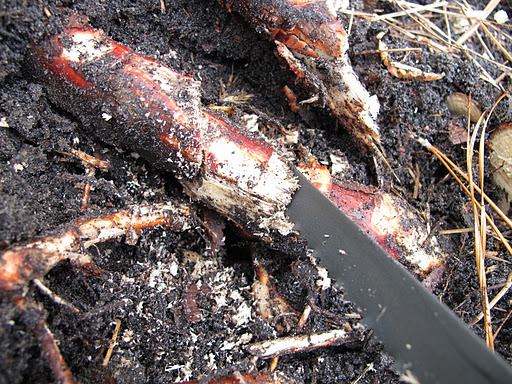 Digging/Pickaxe: The pointed nature of the blade help for digging and pickaxe. Handle telescopes out and is locked in place by rotating counterclockwise. Shovel head is fixed in position by a tightening nut that maybe could be a bit larger. The lightweight did transfer ‘shock’ from striking roots back to the handlers arm/wrist. Lightweight/lack of mass require more energy for digging, etc.. Not intended as a weapon. This is the most lightweight of the tools, thus additional tools such as an axe and crowbar will also be needed to be carried. Case is a bit weak and may wear out quickly (I’ll update if it does). Since this tool has a few parts that separate…there is the possibility that they could be lost. This will mot render the shovel aspect inoperable, but obviously the saw would be. 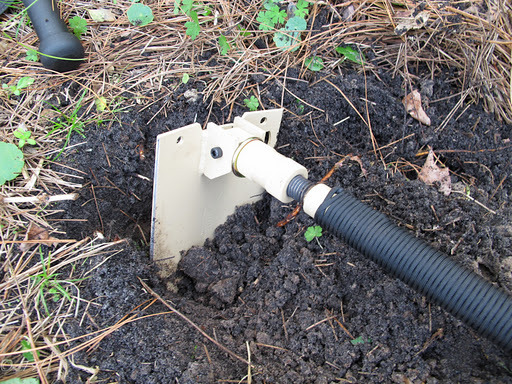 Digging:No problem here…goes through roots and dirt rather well. Handle is easy to grip and sturdy (except when wet..wrap some duct tape for better grip). 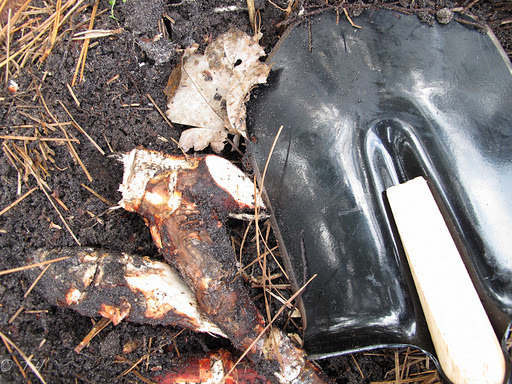 Chopping/Splitting wood:The best out of the 3….roots with 1 swing. 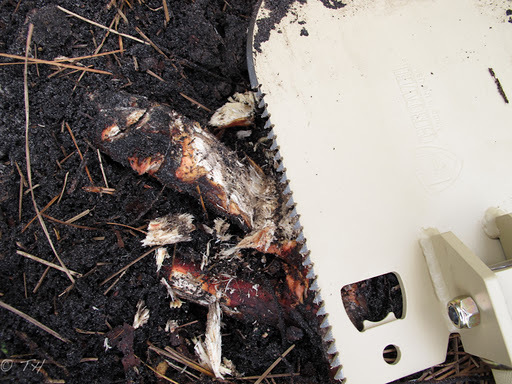 Very sharp blade, branches 3 inches thick were not a problem. Splitting it was second to the Crovel due to lack of mass only. 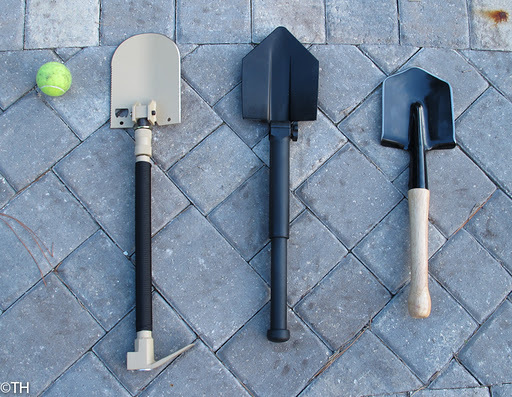 Conclusion:Can be used for digging, chopping, zombie head removal…no pickaxe option. Blade is sharp and MUST have a case. Between the Crovel and Glock tool in size. Though listed as lighter than the Glock, it felt a bit heavier/solid. Edge did show some light rust, thus a thin coat of grease will need to be applied. Cold Steel also shows how the shovel can be thrown and impale targets…I’m not a big fan of throwing tools, knives, axes, etc..the penetration done is usually less than incapacitating. If you miss, your intended target now has your tool/weapon. -I was excited about the Crovel, but disappointed with the results due to the design issues I mentioned and the weight. It’s cost (5 times more than next reviewed), perhaps caused me to be a bit more critical, but I believe this is warranted of any high priced item. -The Glock tool certainly being the lightest/most compact is the easiest to carry, but it’s rather non-solid feel gives me pause. I plan on putting it through a similar abuse the SF tool went through…if it holds up it will get the nod…I will update. 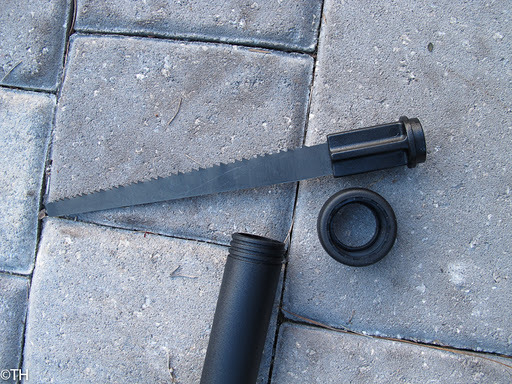 -The Cold Steel, I worked the heck out of it to see at what point the wooden handle would break (hammer, prybar..and yes, I did the throw thing…it did break (10th throw….Cold Steel sells replacements), but I would probably not use it in such a way. At the moment it is my top pick (with case). 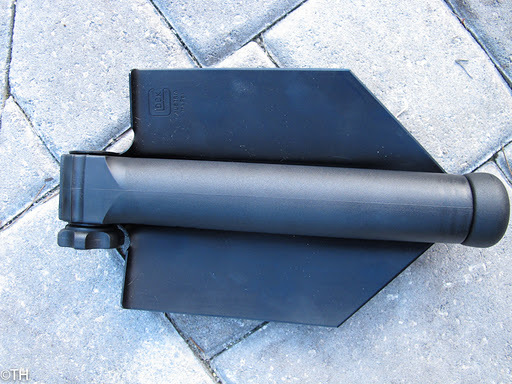 Yes, you can throw it and it sticks into targets…neato!..not practical unless it is the last thing you have and you want to make your enemy bleed before you expire. 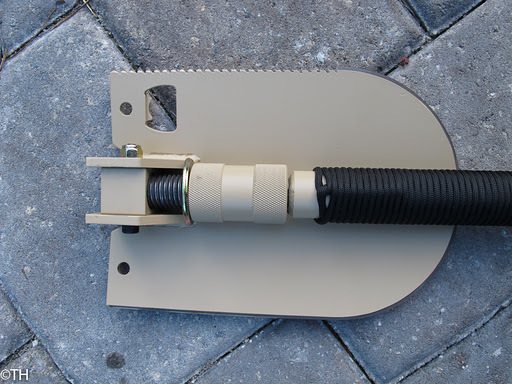 This entry was posted in e-tool shovel survival review, preppers. Bookmark the permalink. I have always wondered how the Cold Steel shovel would stack against the Crovel. I have 2 Cold Steel Shovels, 1 as part of my core of my BOB. and another that I use for Gold Prospecting. 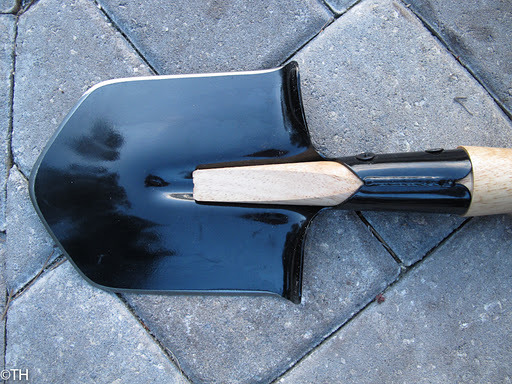 Digging, chopping, slicing, pounding, prying and throwing I have abused this shovel. Comes very sharp. I almost chopped my index finger off at the base a few months ago with this. So yeah 100% agree the sheath is mandatory. And the steel is pretty tough. On one of my trips this year I caught my son cutting rocks in half 2-3 passes with a file and it was good as new. Thanks for taking the time to do the review! I was also impressed with the cold steel. Thanks for commenting. The Crovel, to my knowledge, is the only one to be made in the USA. That right there has to count for something. I stumbled upon this in researching the Crovel II. Thanks for the info. But if it doesn’t work well, and your life depends on it, does where it is made matter? Don’t get me wrong, it is solid, but its ergonomics cause it to not be effective as far as a hammer or crowbar are concerned….of course neither are the Cold Steel or Glock.